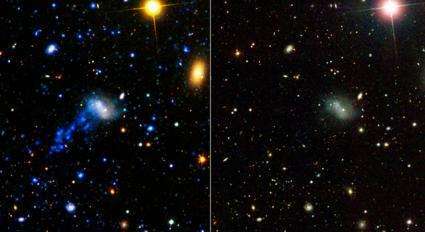 (PhysOrg.com) -- NASA's Galaxy Evolution Explorer has discovered a galaxy tail studded with bright knots of new stars. The tail, which was created as the galaxy IC 3418 plunged into the neighboring Virgo cluster of galaxies, offers new insight into how stars form. The astronomers were able to find this tail with the help of the Galaxy Evolution Explorer. Clusters of massive, young stars speckle the tail, and these stars glow with ultraviolet light that the space telescope can see. The young stars tell scientists that a crucial ingredient for star formation - dense clouds of gas called molecular hydrogen - formed in the wake of this galaxy's plunge. This is the first time astronomers have found solid evidence that clouds of molecular hydrogen can form under the violent conditions present in a turbulent wake. This phenomena of ram-pressure stripping seems to play a important role in the evolution of galaxies within galaxy clusters. As galaxies move through the intracluster medium, gas is shocked and pulled from the disk of the galaxy itself, only to eventually cool and fall toward the cluster center (some gas may also form stars outside the confines of a galaxy, as seen here). The galaxy itself is soon stripped of material for making stars, thereby evolving into so-called "red and dead" galaxies found in most galaxy clusters. What produced the "star-studded tail"? Did stars along the tail form on pre-existing gravitational wells that were formed by fragmentation of a massive neutron star? "Did stars along the tail form on pre-existing gravitational wells that were formed by fragmentation of a massive neutron star?" "The tail is similar to the few other observed star-forming tails, all of which likely formed during RPS [Ram Pressure Stripping]. The tails' morphologies reflect the forces present during their formation and can be used to test for dynamical coupling between molecular and diffuse gas, thereby probing the origin of the star-forming molecular gas."